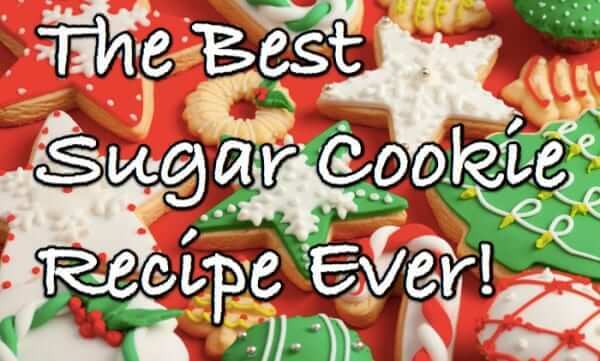 This time of year lots of people are searching online for the ultimate sugar cookie recipe. For that one recipe for the best sugar cookies out there, but one that is also easy to make, and yet allows you to make great cut out or decorated (or cut out and decorated) Christmas sugar cookies. But wait, it also has to be a recipe for make-ahead sugar cookies. Well, this recipe is all that, and more! In fact, every year we try to find one to top it, and… well… we can’t. So here we are, in 2018, and we are bringing you this recipe again. What makes this recipe the best of all sugar cookie recipes? The taste. The texture. How easy the recipe is. And that you can make the dough ahead of time and bake batches at your leisure! Really, this recipe for sugar cookies truly is the best sugar cookie recipe on the Internet – it’s easy, you can make it and roll out the cookies ahead of time, and these cookies taste so good that they are as wonderful plain as they are iced and decorated! 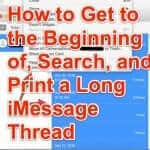 This recipe is based on a recipe first posted to Usenet (later borged as Google Groups) by our friend, Barb Schaller, and which has since been modified by us. So here you go – our holiday gift from us to you! Mix baking powder and salt into the flour, and set aside. Mix shortening, sugar, eggs, and vanilla. Beat until very light and fluffy. Mix in flour mixture alternating with the milk. *NOTE: You may need 1 to 3 more teaspoons of milk, depending on your flour, your altitude, the alignment of the planets, and your karma. You want the dough to be stiff, but pliable enough to ball up and roll out. Now, this is the point at which most recipes will tell you to chill the dough for several hours or overnight. But we are not going to tell you to do that! Tear off two pieces of parchment paper, each about the size of a cookie sheet. Put one piece of parchment paper on your counter. Now take about one-third of the dough (for thicker cookies) or one-quarter of the dough (for thinner cookies), shape it into a ball, and put the ball in the middle of the piece of parchment paper. Flatten the ball of dough, and put the other piece of parchment paper on top of the ball of dough. Roll out the dough between the two pieces of parchment paper until it is about 1/4 inch thick (less for thinner cookies). Leave the dough sandwiched between the two pieces of parchment paper. Stack all of the dough-and-parchment-paper sandwiches on top of each other, and put them in your refrigerator for a few hours (or overnight). When you are ready to bake your cookies, preheat your oven to 400 degrees Farenheit. Remove one of the already rolled out dough pieces, and put it, with the parchment paper, on an ungreased cookie sheet (yes, really). Remove the top piece of parchment paper, and cut out your cookies, right there on the parchment-lined cookie sheet. Remove all of the excess cookie dough (reserve it in a bowl). Your cookies are now ready to bake! Bake at 400 degrees for 9 minutes, or until edges just start to darken. This method is so wonderful! You can prepare your dough hours in advance (or the day before) and when you are ready to bake cookies, you don’t have to hassle with rolling out the dough, getting the counter all messy again, etc. – you just remove the dough, cut the cookies, and bake! Follow mixing and baking instructions for Best Sugar Cookies Recipe on the Internet. 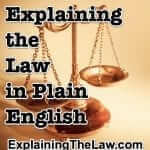 Please Welcome Our Sister Site: Explaining the Law.com! This is the best sugar cookie recipe! It's easy to make, you can make and roll it out ahead of time, and it makes great cut out, decorated Christmas sugar cookies! Sounded good until I saw the word Crisco. Sounds perfect – I’ll have to try this over the weekend. Thanks! This was the best way to roll the cookies. I haven’t eaten them yet (dough is chilling) but I LOATHE rolling out dough, and this was so easy!